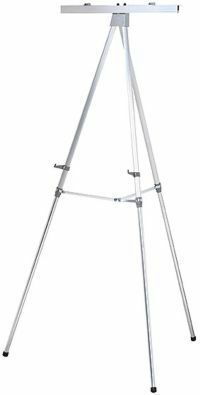 Quartet Tri-Max Dual Purpose easel is perfect for show environments or office use and comes complete with a silver pad retainer. � Place flipchart pads, artwork and signs in easy view. � Adjust the easel to the perfect height to improve communication. � Silver aluminium construction and cross-brace enhances stability. � Height is adjustable from 965mm to 1675mm. � Supports up to 16kgs display weight. � Includes silver pad retainer.